I drink water all day everyday except for the other morning when I woke up with an epic headache that just wouldn’t go away. I waited until my lunch break to dart to the corner drugstore to pick up some Excedrin when it occurred to me that I had forgotten to bring my water along. So before queing up to pay for my head remedy, I quickly scanned the cooler and picked up a coconut drink that appeared on the surface to be better for me than say, Diet Coke. 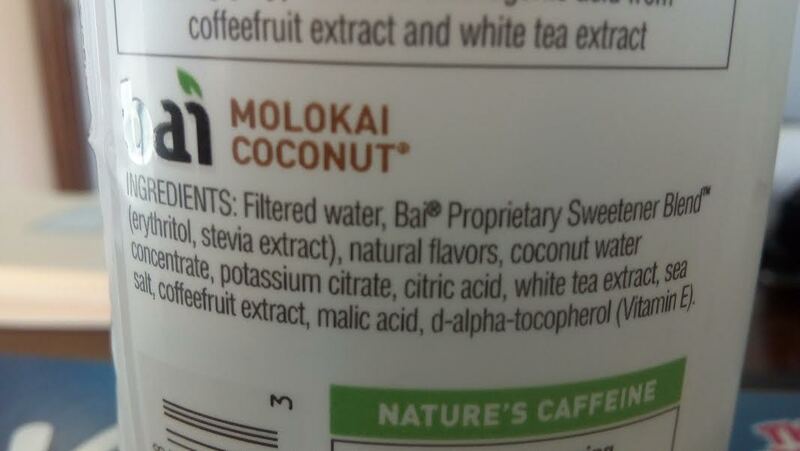 My first thought as I swigged down my Excedrins in the car with my baì Molokai Coconut was wow, this is good—and sweet. It wasn’t until I was back at my desk that I decided to take a look at what was in the coconut water. I have been trying for some time to stay away from anything that may contain GMOs along with trying to eat only organic vegetables. This means out of necessity, I am a label reader. So what was in this drink that contained only 5 calories and whose subliminal and clever graphics wanted me to think it was healthy for me? 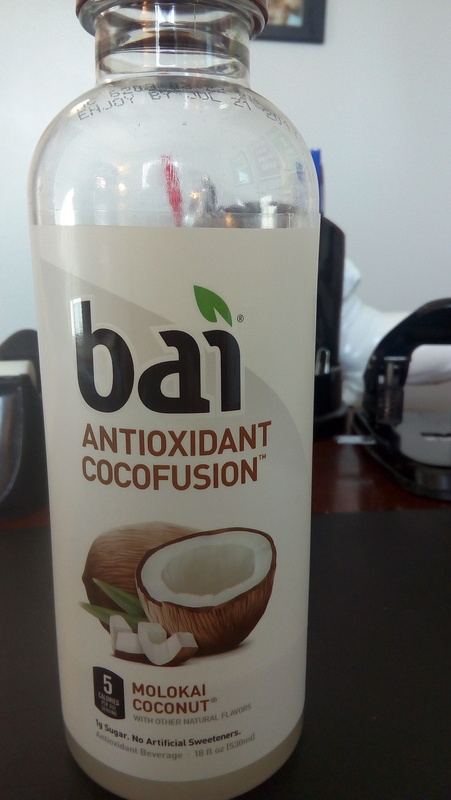 First, once I examined the actual print, the drink only contained 6% coconut. A miniscule amount, really. So why was it so sweet? Turns out it contained an ingredient I’d never heard of before—erythritol—a commonly used ingredient in sugar free or low sugar foods that has gained in widespread use and popularity, particularly in vitamin water and energy drinks. No doubt because the average consumer is now all too aware of the health risks of high fructose corn syrup. Erythritol is a naturally occurring substance in some fruits and fermented foods, but the type being added to to my baì beverage and most other beverages, is almost always manufactured with GMO cornstarch. Erythritol is a sugar alcohol, a sweetener that does not provide as many calories as sugar. But the reason that sugar alcohols provide fewer calories than sugar is because they are not completely absorbed into your body. Erythritol by itself, even in low amounts, can cause diarrhea, stomach ache, and headaches in some people because of the sugar alcohol. The substance does not get metabolized, or absorbed, by the body when it is ingested. Erythritol is also the main component of Truvia, which has proven to be a potent insecticide. Truvia, which is marketed as stevia, is 95% genetically modified erythritol, unlike the natural stevia, which has been used for thousands of years and does not cause harm to humans. Erythritol is not as sweet as sugar so it is often combined with artificial sweeteners like aspartame, making it even more desirable to avoid, particularly for children. In 2012, a pediatric study examined the GI tolerability of erythritol in children ages 4 to 6 in a single drinking occasion. The researchers concluded that there was a safety concern with respect to GI tolerability in beverages at a maximum level of 2.5% for non-sweetening purposes. Though erythritol is not as harmful as other artificial sweeteners, I would not willingly consume it because of its high probability of it containing hidden GMOs, which have terrible health consequences, or if you have issues where alcohol sugars would likely irritate the gastrointestinal system. The take away? You have to read labels even when you are on the run and something is marketed as “healthy,” particularly vitamin water, energy drinks, and sports drinks. I would have been just as satisfied, maybe more so, with just unsweetened coconut juice and water but manufacturers are in the business of making money and a sweet drink marketed as a healthy alternative to soda works. Read your labels and reign well.